Gowda said Mr Kumaraswamy’s government launched projects worth Rs 8,500 crores exclusively for Mandya district. 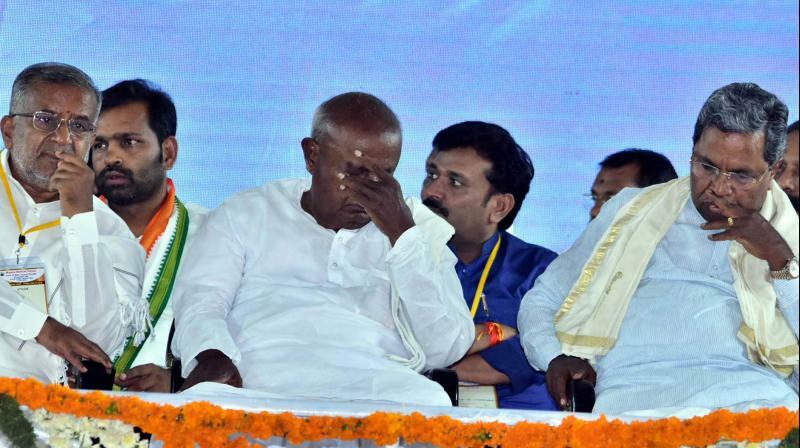 Mandya: Braving sweltering sun, JD (S) patriarch H D Deve Gowda and his son and Chief Minister H D Kumaraswamy teamed up to crisscross this sugar bowl in order to garner support of voters for their kin, Nikhil Kumara swamy, on Saturday. The father-and-son combine spoke about contributions of the coalition government for development of the district as their special vehicle inched through Mandya town and neighbouring villages. Mr Gowda said Mr Kumaraswamy’s government launched projects worth Rs 8,500 crores exclusively for Mandya district. Besides, the government waived crop loans to the tune of Rs 500 crores for farmers of Mandya district, he added. The former Prime Minister justified the decision to field his grandson in Mandya saying he had no choice but to yield to the pressure of local legislators in this regard. Mr Gowda did not name independent candidate Mrs Sumalatha Amba reesh, but mocked at her saying he was not aware of projects which were left incomplete by the late actor and which he was keen to put the finishing touches on them. "Kumaranna (CM) arranged for decent last rites of Mr Ambareesh which was better than the last rites of Dr Rajkumar. In spite of all this, I don’t know why she has been targeting my son and grandson. I have full faith in voters of Mandya, and they will support Mr Nikhil", he added. A garland of gargantuan proportions, made of apples, was offered to Mr Gowda and the Chief Minister by party workers during their campaign.